As the name suggests dry brushing is just that - brushing dry skin with a dry brush. It is pretty simple and only requires one tool - the dry brush. When selecting a body brush ensure that it features 100% natural bristles and that it has a long handle, to reach the awkward areas of the body such as the back. I find the easiest way to brush is to do so before showering, strip down and begin by using long brush strokes from the feet up. To boost circulation, it is always recommend that you brush towards the heart and be sure to overlap brush strokes to thoroughly exfolaite the body. I recommend dry brushing before bathing or showering and not in the PM (the boost to the circulation is stimulating and energising) so you can wash away any dead skin cells. How often you brush the skin is entirely up to you, I find the more frequently you do it the greater the benefits; typically I aim to dry brush at least twice a week. I must warn that the first few times you try the process, it can feel a little irritating but the skin does build up a tolerance and it quickly becomes enjoyable. If you really find it intolerable, you could try a damp skin/damp brush combination or even use a body oil to create a barrier? Although not a typical technique, I see no reason why you couldn't use the brush in conjunction with a shower gel if you find the dry method too uncomfortable. 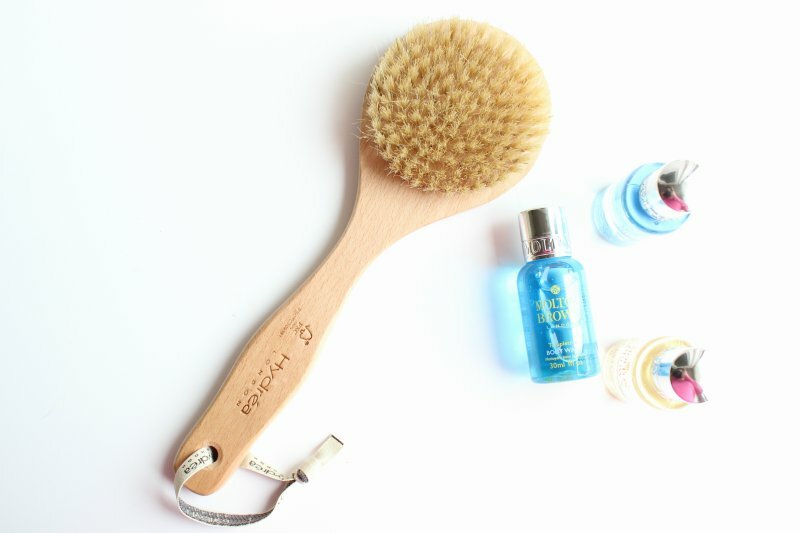 Dry brushing offers so many more benefits than silky soft skin, for instance did you know that by brushing you are stimulating the lymphatic system. As you may know the lymphatic system is part of the body’s immune system, lymph vessels run below the surface of the skin and dry brushing can stimulate the natural lymph flow process, ridding the body of toxins naturally. This in turn, may help improve the appearance of dimpled skin aka cellulite. I must stress that this will not offer instant results as far as cellulite goes but surely it is worth persevering with if dimpled skin is a problem? As a side note, I have found that dry brushing is great for improving skin texture and refining the appearance of particularly angry looking stretch marks. Other benefits include deep cleansing; yes the brush removes dead skin cells but it also helps shift dirt, grime and sebum trapped deep within the pores, as well as being a great method for preventing ingrown hairs. Rather impressive for a beauty item that costs less than £10 and only requires a few minutes of your time non? Are you a firm advocate of dry brushing? For anyone wondering, my body brush is from Amazon and costs £6.87 - link. I recently started Dry Brushing and i'm absolutely in love with it. I do it three times a week, in the morning before I hop into the shower. Like with everything it's all about time! 10 minutes is not long but with everything else it gets neglected! I am in need of a bit of dry brushing though as my tan is starting to peel off...nice! ooh i've literally never heard of dry brushing! this sounds like such a fab idea and definitely going to look into this! Never tried this, but I always use rough loofah with my shower gel every day. Will it have the same blood circulation aid effect? I never tried this but I really want to try it cause it looks really good. I should try out dry brushing soon. I've heard so much about the benefits of it and I always get really tired legs from work therefore this would be great to boost my circulation! I've heard loads on this & I really want to try it out but I've just not had a chance! I've heard a lot of good reviews on dry brushing. I do it my self now and I've gotten used too it now! I've never tried dry brushing before but it sounds really interesting! This sounds fab. I know a few people who swear by dry brushing and it does sound like it's worth the effort. I have started just a week ago, try to do it every morning when I first get up, only for about 2 minutes or so. It feels lovely, like a massage and makes my skin feel soft to start the day with. Got a nice natural brush from Boots for £7 but only a handheld one, not one with a long handle which I slightly regret now.